Chromium is of interest to people with diabetes as it has been suggested that Chromium Picolinate could be particularly suitable for lowering blood sugar levels. Supplements are increasingly becoming recognised as having a place in the management and treatment of diabetes. However, each separate naturally occurring or manufactured supplement will affect different people in different ways. Chromium is an essential mineral. Chromium may potentate insulin, and is usually lost in processed foods. According to some studies, Chromium Picolinate can have a significant effect on diabetes. Is there an upper limit for Chromium Supplementation? According to the American IOM (Institute of Medicine), following an extensive review of scientific literature about chromium picolinate, there is no reason to set an upper limit (UL) for Chromium. In theory, this means that there are no substantive safety concerns about chromium. So, as a diabetic, should I be taking chromium? This remains uncertain, although medical research lends support to the idea that chromium can be useful. Dr. Byron Hoogwerf of the Cleveland Clinic Heart Centre, said: “Routine use of chromium supplementation in diabetic patients who have overall adequate nutrition has not consistently shown benefit. Therefore, routine chromium supplementation has not been incorporated into the nutrition guidelines published by the American Diabetes Association. CADRE stands for Council for the Advancement of Diabetes Research and Education. 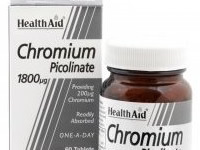 Are there health concerns about chromium picolinate and diabetes? Yes, there are. Despite overwhelming evidence to the contrary, some experts do believe that chromium can be harmful. As chromium could have an influence on the neurotransmitters, some experts think that the supplement could harm individuals who suffer from depression, bipolar disorder or schizophrenia. Furthermore, chromium can cause severe skin reactions. So should diabetic people take chromium? To assess whether to take chromium, patients should discuss their individual situation carefully with a healthcare expert. Until the various different forms of chromium are subjected to extensive research, there is no certain way of knowing whether chromium is a suitable treatment for diabetes.